A former Argentine footballer believes that blues music is exactly what his country’s team needs to become the best around. Hector Andres Bracamonte, who spent a decade playing football in Russia, has put together a blues band to accompany his country’s squad during this summer’s World Cup in Russia. Bracamonte’s has nailed his formula of happiness: football, music and friends. Simple things which bring people put together and hold the promise of an unforgettable adventure. Hector came up the idea when a friend of his, who had also spent some time living in Russia, asked him why doesn’t he join the Argentine football team when they play at the World Cup in Russia. “Who was I to say no? We put together a band and are getting ready for a tour,” Hector told Sputnik. The band will be getting down in the cities where the Argentine team is slated to play: Moscow, Nizhny Novgorod and St. Petersburg. The Bracamonte Football Blues Band has already been signed to play the first three cities and may add new venues to their tour schedule as they go. “We are going to accompany our team, play and have a good time. We’ll be playing and paying our way while we are on the road. We are not rehearsing, we don’t have a song list, we’ll be improvising, that’s all. The only one who is rehearsing is me. The others are just natural born musicians,” said the ex-footballer who sings and plays the guitar. Hector said that it was his bandmates who had come up with the name for their band. “They figured that because people in Russia know me, we’ll be better off going under this name,” he noted. 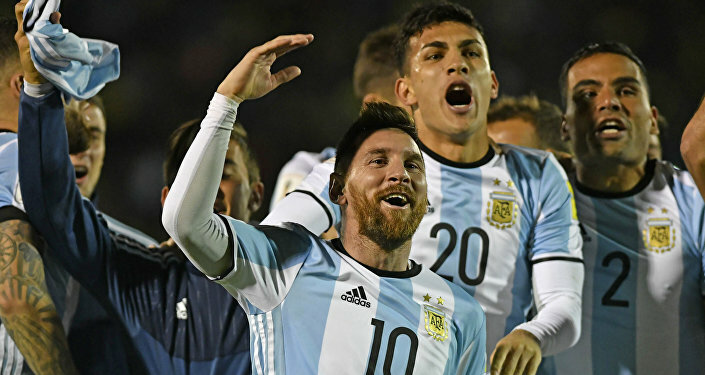 Hector believes that having the world’s number one player Lionel Messi in their lineup, the Argentine squad has a good chance of making it through all the seven rounds of the World Cup. He thinks that Argentina aside, Brazil, Germany, Spain and maybe Belgium have the best chances of coming out on top. Bracamonte, who lived in Russia from 2003 until 2012, said that the host country is a guarantor of an amazing tournament. “When Russians are going to do something right, they devote themselves wholly to the process and always pull it off. I think this championship will be special for many reasons: because Russia and Russians are so specific, because Russia is so big and has many languages and cultures in one place. Let’s hope that we are going to see something really out of this world,” Hector concluded. Russia will host its first FIFA World Cup from June 14 to July 15. The game will be played in Kaliningrad, Kazan, Moscow, Nizhny Novgorod, Rostov-on-Don, Samara, Saransk, Sochi, St. Petersburg, Volgograd, and Yekaterinburg.